I was in the fight at Manassas Gap or Bull’s Run, as it may be called. The place has two names but I think Bull’s Run is the right one, by the way they treated us there. Out of our band of 320 marines that entered the field we only brought about 150 home with us. We were the first called to assist the Sixty-ninth. We faced them on the left of the battery, and when about fifty yards from it our men fell like hail stones. I had only fired three shots when my musket received a ball right at the lock, which put me back about three feet. As soon as I came to my ground again two men were shot down on my right and one on my left; about this time I began to look very warlike. As for my part I thought I would lose all presence of mind in such a place, but it was quite different; I was as cool as a cucumber. Then we got orders to retreat and the Sixty-ninth and Ellsworth Zouaves played on them again. This was the time they suffered; they only stood a few minutes when they retreated without orders. Then we were again called on to face the enemy, fifty thousand strong, while we had only about 200. This time we got the Seventy-First to relieve us, but to no purpose; we had to retreat. Then it was a general retreat all round; every one looked out for himself, but they took the short road and caught us again. If you had seen us swimming across Bull’s Run, you would have thought there was something after us then. We had to come to Washington, a distance of forty five miles, in our wet clothes, which were badly used up. The route we took in going to Manassas Gap was by Arlington Heights and thence by Fairfax Court House, where several batteries had been erected. This was the first time we knew we had to fight; they never told us where we were going till then. When we were about a mile from the place they got us to load our muskets. We were the first up to the battery, where we were drawn up in line of battle, when we found that the rebels had fled to Manassas. Then the cavalry were sent in hot pursuit of the enemy, but failed to overtake them. 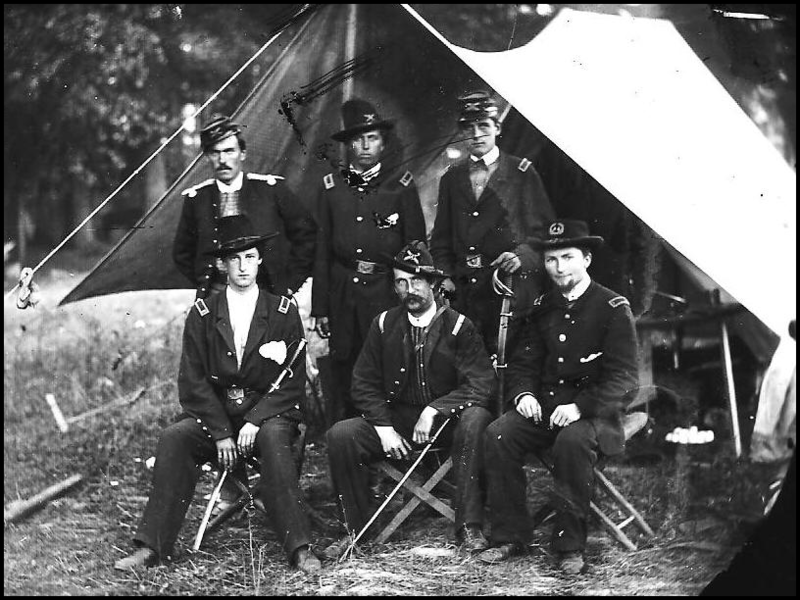 We camped in Fairfax that night, and the boys enjoyed themselves by burning down the houses of the secessionists. Next morning we took the march again, and went to Centreville by night; here we encamped two days. On Monday morning at three o’clock we marched to the field, and as well as I can mind it was ten or eleven o’clock when we got there. It then looked very hot. The Seventy-first was the only regiment then at them. When we arrived, just as we got out of the woods in the rear of the battery, we lost three men by cannon balls. I could not describe to you what the battle field looked like. At the time of the retreat we ran over the dead and wounded for a mile from the battery and to hear the wounded crying for help would have made the heart of stone ache. All along the road we had men, only wounded a little, who, when the long march came, had to give out and lie down to die. For ten miles this side of the field they could be seen lying here and there on the road-side. Only four or five of the Pittsburgh boys, that I know of, were killed. One young fellow, named Frank Harris, who joined the Irish volunteers in Pittsburgh, was my right hand man; going up to the battery he did not fire a single shot; he was one of the first to fall. There were but few of the marines who were not wounded. I believe there are not thirty in the barracks who are not wounded more or less. I think they intended to fix me when they hit the lock of my musket. You could hear the ball playing “Yankee Doodle” around your ears, but could not move . It was about as hot a place as I ever want to be in. I saw a horse’s head taken off by a cannon ball at the time of our retreat; but he kept on ten or twelve yards before he found out that he was dead, then dropped and the poor fellow that was on his back had to take the hard road for it. I cannot tell you any more about the battle at present, as I am very tired, have not slept any for forty-eight hours and marched from forty to fifty miles, fighting our way. I wish you would send me a Pittsburgh paper with an account of the battle, that I can see the difference in it. Source of identification of Barrett as the letter writer here and here. William Barrett USMC muster sheets 1861-1864 here. What the Men had to Eat – Effect of the Enemy’s Batteries – Fatal Mistake of the Wisconsin Regiment – Strange Incident – The Retreat. Dear – : I suppose you have full accounts of the battle that was fought yesterday around Bull’s Run. I received your last letter just as we were about to start for that place, and the nature of its contents made me answer it immediately with what means I had at hand. I had, as you may imagine, but little time and less materials then, and I sent it by a Priest who had come all the way from Washington to assist our own Chaplain in his duties that evening, and who was to return when the regiment started. The battle was fearful, and the Sixty ninth did its duty to the last moment. I have come back to Washington this 2 P. M., to recruit a little from the great fatigue I suffered, and you will see by this that my ideas are yet a little confused. 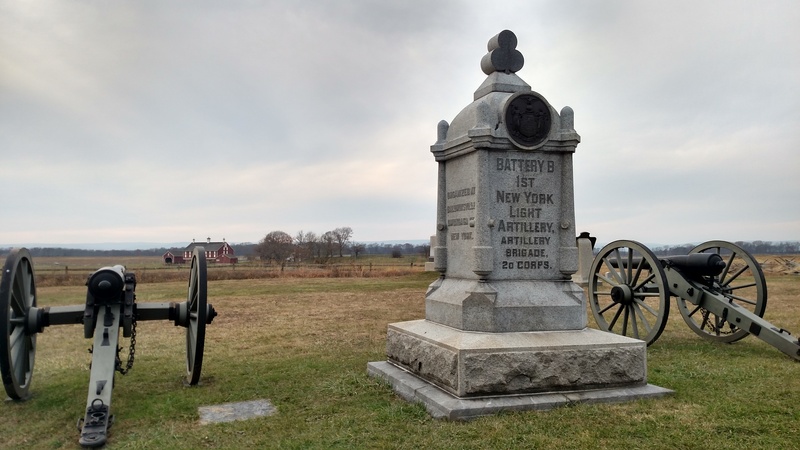 We did not move from our camping ground, after all, until 2 A. M. of yesterday, and by daylight we came in sight of the rebel batteries, when we were halted, and disposed to the best advantage for the battle. We were now in the rear of the batteries which were unsuccessfully attacked last Thursday, on the line of a road which led directly to them. The first cannon was fired exactly at half past six which was continued without an answer from the rebels until half-past eight, when the fight began in earnest. 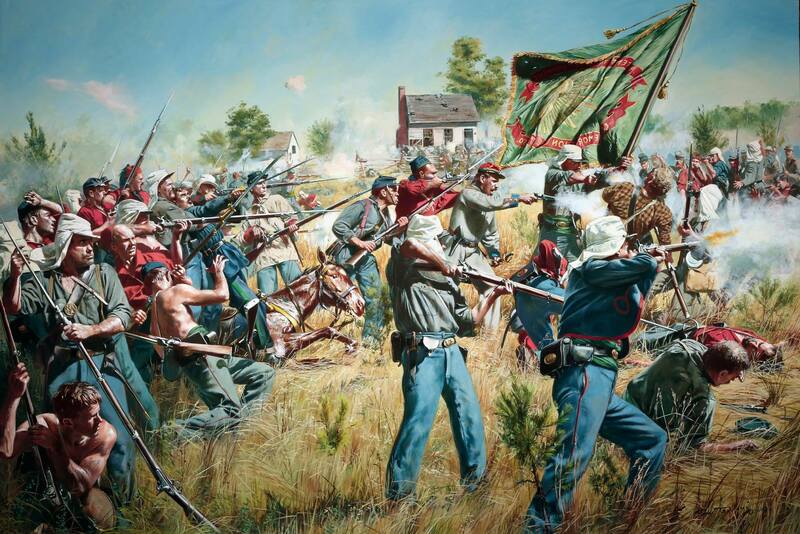 At eight o’clock we were marched out of the woods where we had laid hidden, to protect our own guns from a charge, and sallied out into the open field, up a steep hill, where a fierce contest was raging between our forces and the rebel infantry. The enemy’s guns played on us at the moment we broke cover, and we did not reach the desired spot until after a sharp contest; we drove a lot of the enemy out of a wood which we had to pass. Again we were attacked by a small party of skirmishers hidden in an orchard right on the edge of the battle-field, and there we lost three or four men including Captain Haggerty of Company A, who was at the time acting as Lieutenant Colonel in place of Nugent, who had not sufficiently recovered from the accident he met with to accompany us. When the enemy saw us coming to reinforce our men, they retired to their batteries, which we were then ordered to storm. We had to run over half a mile, with three or four of the batteries throwing shell and grape shot at us, until we got under the hill on which the one that we were to attack was erected. Without a moment’s breathing space, we mounted the hill, and, being formed, we marched up to the trenches, and blazed away at the enemy. The fire we there received was terrific, and laid many of our brave boys low. The whole ramparts were every few moments a sheet of flame, and I never expected to see you again in this world. Twice we were repulsed, and at the third charge the Second Regiment, Wisconsin, which was sent to our aid, fired into us from the rear, mistaking us through the smoke to be the enemy. That, and a charge of rebel cavalry, threw our ranks into confusion, and we were compelled for the third and last time to retire, leaving I should think some four hundred of our comrades dead and wounded on the field. We were engaged from eight A. M. until five P. M., or thereabouts, having had nothing but coffee and crackers the evening before, so you may form some idea of our fatigue. The regiments which had attacked the batteries were nearly all cut up and scattered, and sought shelter in every hole and ravine, from the terrible fire of masked batteries, which then seemed to have sprung up in every clump of bushes. The scene was desperate. Men who ha bravely marched to the cannon’s mouth, were now seized with panic, and fled in every direction, vainly striving to get out of range of the enemy’s guns, which now threw shell and grape in every direction. How I came through it all without a wound could only be by, I might almost say, the direct interposition of the Almighty. After the regiment was reduced to a few men, I left that scene of carnage, escaped the cavalry, and reached a road, on which hundreds were flying away. I was fatigued almost to death; but still all hurried along to where they hardly knew. At last we struck upon the Centerville road, which was distant probably eight or nine miles, and having reached there, pushed on to Fairfax, fifteen miles or so more. We travelled all night to three A. M., when we reached Falls Church village, where I supposed the rebels could not pursue us; and, at any rate, I could go no further, as I was almost raving with fatigue and thirst, and, throwing myself down on the grass by the roadside along with a comrade, I lay in a sort of a half dreamy state until daylight when, not being able to hire a horse or wagon, we were again compelled to take the road, and reached the fort about ten or eleven A. M. to-day. The distance travelled was between thirty-five and forty miles, and after what I went through that day, you will agree with me that I require a little rest. When I arrived at the fort, I found it garrisoned b the Twenty-fifth Albany Regiment, and full of soldiers who had reached there during the night. Colonel Corcoran had not been heard from; it was thought he had been taken prisoner, until word reached just before I left that he was in Willard’s Hotel wounded in the knee. My first thought after arriving was to telegraph you of my safety; but I found the greatest difficulty in getting across the bridge, double guards being stationed there, and it was only by discovering that the officer of the guard (who was a Dutchman) did not know that Colonel Corcoran was absent that I succeeded, by presenting a pass from him (the Colonel), so that it was between two and three o’clock before I reached the telegraph office and sent you the dispatch, which I trust you have received. I saw Peter Daly in the fort all safe. One of the young men who came with me from Mrs. K—‘s was wounded and taken prisoner, or killed, I have reason to fear, after we left the field. Before going into the fight we were ordered to throw down our blankets and haversacks, which, of course, are all lost. There was nothing of value in the haversack but a revolver, and I can get another one without any trouble. Tell your mother that during the fight I lost both the gold dollar and the cross which F— gave me, but how I cannot tell; the chain I found cut and the hook broken, so that it may have been a stray ball, as they whistled all around when we were attacking the battery. I thought I would have had that dollar as long as I lived, but now it is gone, and the cross also. I have a good notion to make Uncle Sam pay for both, only I don’t think he is rich enough to pay at present. Perhaps I may yet come across some rebel wearing it, and then there will be a row. I had a good many curiosities for you which I picked up along the march, but lost all save these three papers which I took out of a secessionist’s house in Centerville after it was set on fire by our troops contrary to orders.